Happy Clicker, Enjoy Idle Game, Very Good Slam Dunk Skill.Idle Dunk Masters is one of a kind hyper casual idle clicker game. Become a legend basketball player!Idle Dunk Masters is a simple endless idle game. 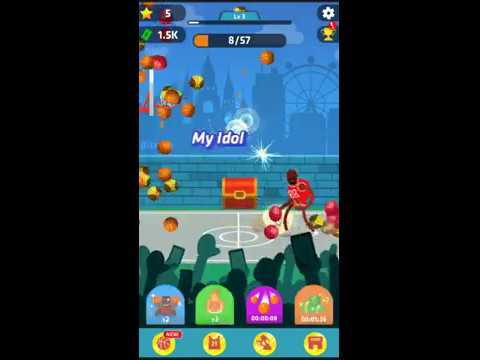 Tap to throw basketballs to the basket to get points and get skills.Idle Dunk Masters also h... see more Happy Clicker, Enjoy Idle Game, Very Good Slam Dunk Skill. Idle Dunk Masters is one of a kind hyper casual idle clicker game. Become a legend basketball player! Idle Dunk Masters is a simple endless idle game. Tap to throw basketballs to the basket to get points and get skills. Idle Dunk Masters also has a lot of collections. There are a lot of different balls in this idle game: Basketball, Basketball Purple, Basketball Yellow, Soccer Ball, Tennis ball, Golf Ball, Billard ball, Volley Ball, Bowling Ball, Beach Ball, Football, Hammer, Smile Face, Easter Egg, Eye Ball, Robo Ball, Skull, Thunder Ball, Watermelon, Heart, Orange, Moon, Earth, and Magmastone!! In Idle Dunk Masters, you can unlock your favorite dunk skills: Alley-Oop, Free Throw Line, Tomahawk, Two Hands, Windmill, Between The Leg, Double Clutch, Rock the Cradle, Off the Backboard, Superman! Tap on screen faster to get points quicker! Upgrade your stats and become the mightiest basketball player in this idle clicker game! Use boosters to enjoy Idle Dunk Masters as idle game: Auto throw, X2 damage, Ball rain, X2 Cash. Transform into the legend basketball player in Idle Dunk Masters. Enjoy throwing balls and become the best basketball player of all time! Idle Dunk Masters Prestige collection: Alley-Oop, Free Throw Line, Tomahawk, Two Hands, Windmill, Between The Leg, Double Clutch, Rock the Cradle, Off the Backboard, Superman, and more! 6 - Join Youth, School, College, League, Professional, National cup.